WD raised all the prices of the re certified items just before Black Friday came along. Thanks OP, was waiting for this to come back on offer. 4TB seems to be the best price/capacity..
Can you store music files on this and access it though your home WiFi? WD raised all the prices of the re certified items just before Black …WD raised all the prices of the re certified items just before Black Friday came along.Very sneaky. Agreed, the 4Tb were £57.99 a week or so ago...time machine comments aside, if you're not in a hurry it might be worth sitting tight until they drop a bit more? As for re-certified drives, touch wood, I've purchased 3 from Western Digital last one c2 years ago and all are still performing A-OK. Guess not a bad price still though. yeah just wait and wait boys. It's going to go cheaper again. 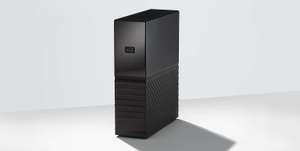 Which WD external drive has DNLA and NAS capabilities?